... a new house and kid-sized firetruck (that doubles as a book). The kids set to work decorating the house and began a full interior remodel by adding several homey touches including a fireplace, recessed lights, and a rocket launcher. The exterior still requires some TLC. That house is SO cool! I haven't seen it before. How fun is that!?! LOVE the firetruck! Where did you find it? 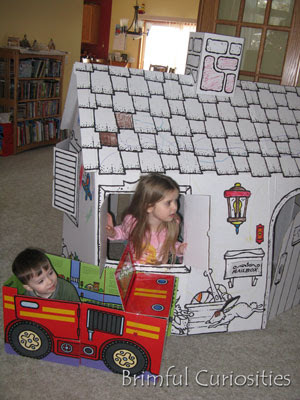 The house is Discovery Kids Color Me Cardboard Playhouse (available from JCPenney). The Fire Truck Convertible (ISBN 9781842368534) book is by Miles Kelly Publishing and is rather hard to find. I believe Santa ordered it from the Children's Book of the Month Club, but they no longer carry it. The fire truck book is sooo cool. It is wonderful that is doubles as a toy. It looks like a fantastic fun gifts from Santa. Cute gifts - I love the house! That house is adorable! What fun! Oh that looks sooo much fun! I bet there will be lots of play to come for that house and truck! Ahh the simple things for kids. Oh, how my boys would LOVE them both. Sweet capture! Hope 2011 is is full of fun for all of you!